Gabriele Bertaccini is the author of this week’s Tuscan Box. 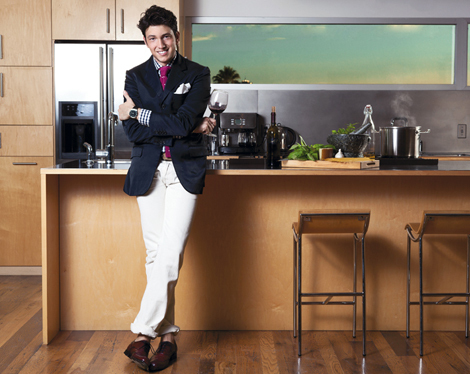 Born in Florence, Italy, and inspired by his family’s love for food and his native land, Gabriele Bertaccini discovered his passion for cooking as a young boy. At the age of thirteen, Gabriele landed his first job at a local restaurant where he washed dishes and pans. Not too long after that, he bought a suitcase of knives and started cooking. Since then, he’s never stopped. Gabriele writes for several food magazines and publications, and regularly appears on NBC and other local and national television shows. You can follow him on Twitter @gabebertaccini and on his website www.iltoccofood.com. Picture wild mushrooms and flavorful white beans among the vibrant and expansive rolling hills of Tuscany. It is simply breathtaking. And charming. Can you hear the Italian? Walk inside the perfect villa, listen and inhale the wafting aroma of Tuscan Cassoulet with Parmesan. Now find a warm corner. There is nothing more comforting than that Tuscan countryside kitchen with the most amazing dishes. With Gabriele’s Tuscan Box and the autumn harvest from our local growers, you’ll be able to recreate all of these delicate smells for your family. You’ll also have the cornerstone of Chef Gabe’s cooking philosophy in the palm of your hands: Italian hospitality. Delizioso! Omnivore 5-meal Culinary Inspirations Box for the Grilled Tuscan Steak with Sautéed Chanterelles and Roasted Heirloom Potatoes with Raw Fennel Salad, Involtini Di Pollo with Sauteed Tuscan Kale and Caramelized Cumini-Roasted Carrots, Sliders with Caramelized Leeks and Roasted Winter Squash, Tomato and Leek Farro, Tuscan Cassoulet Soup, and Leopard Lettuce Salad, plus additional staples and fruit. Vegetarian 5-meal Culinary Inspirations Box for the Tomato and Leek Farro, Tuscan Cassoulet Soup, Sauteed Tuscan Kale, Caramelized Cumin-Roasted Carrots, Leopard Lettuce Salad, and Ultimate Autumn Frittata with Crispy Chanterelles plus additional staples and fruit. Omnivore 2-meal Culinary Inspirations Box for the Grilled Tuscan Steak with Sautéed Chanterelles and Roasted Heirloom Potatoes with Raw Fennel Salad, and the Tuscan Cassoulet Soup, plus additional staples and fruit. Vegetarian 2-meal Culinary Inspirations Box for the Tomato and Leek Farro and the Tuscan Cassoulet Soup, plus additional staples and fruit.